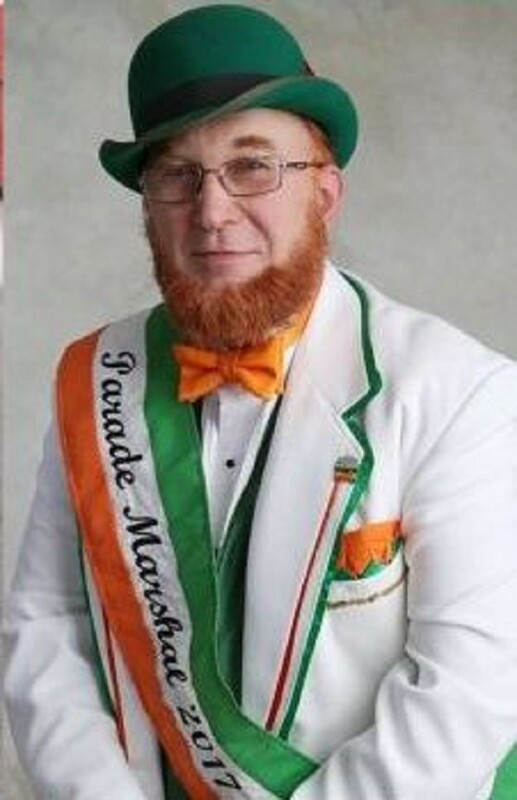 Rob Schmidt, this year's St. Patrick's Day parade marshal, poses in all his "Irish" glory. Bay County TV will be live streaming the 63rd Annual Bay City St. Patrick's Day Parade this Sunday starting at 2 PM. To watch visit Charter Communication Channel 190 or www.youtube.com/baycountymi and click the LIVE NOW video on Sunday at 2 PM. Please join our Parade Marshal Rob Schmidt, our 2017 Queens Court and association members at a church service honoring St. Patrick. Central High School Marching Band, Local Boy Scout troops, Auburn Accordion Marching Band, Knights of Columbus Fourth Degree Drill Team, AAA Furniture, Michigan Bell Telephone, Gillman Plumbing, Sabourin Drugs, Munger Civil Defense Unit. Past parades have featured the Notre Dame marching band and pipe bands from the U.S. and Canada. Among the marchers in the parade have been Michigan's governor, Uncle Sam and a "bonafide" leprechaun. Horses, motorcycles, and Irish Wolfhounds have all been in our parades.